This image shows grooves in the southern part of Saturn's moon Enceladus. The image was created using synthetic-aperture radar (SAR) data acquired by NASA's Cassini spacecraft on Nov. 6, 2011. The radar image is overlaid in light blue over an earlier visible-light image. New details about Enceladus, one of the icy moons orbiting Saturn, are revealed in new images of the bright and shimmering cosmic body. The snapshots highlight some of the grooves in Enceladus' south polar region, including unexpected textures in the moon's ice. The photos, taken by NASA's Cassini spacecraft on Nov. 6, are the highest-resolution images of this region obtained so far, according to NASA officials. The new images of Enceladus come from data collected by a special radar instrument on Cassini, called the synthetic aperture radar. 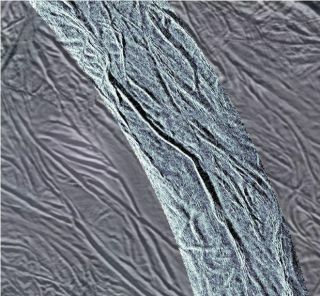 The area photographed by Cassini does not include Enceladus' famous "tiger stripes," which are huge fissures on the moon's ice-covered surface that eject plumes of ice particles and water vapor. These icy geysers cover regions just a few hundred miles away from the stripes, NASA scientists said. "It's puzzling why this is some of the brightest stuff Cassini has seen," Steve Wall, deputy leader of Cassini's radar team at NASA's Jet Propulsion Laboratory in Pasadena, Calif., said in a statement. "One possibility is that the area is studded with rounded ice rocks. But we can't yet explain how that would happen." Scientists are also investigating an area where Cassini spotted grooved, water-ice bedrock. The spacecraft's images reveal unusual undulations and intricate patterns that have not previously been seen. This area is located at around 65 degrees south latitude and 293 degrees west longitude on the icy moon. Cassini's observations also reveal a central groove in this area that is about 2,100 feet (650 meters) deep and 1.2 miles (2 kilometers) wide, with sides that slope at an angle of about 33 degrees. Enceladus is the sixth-largest moon around Saturn, and new images of the satellite show some similarities to Titan, the largest moon orbiting the ringed planet. The western foothills in the so-called Xanadu region of Titan are also very bright, as are regions surrounding a large impact crater called Sinlap. Whether these luminous areas shine because of the same or very different processes will be the subject of research as scientists continue to learn more about the moons of Saturn, NASA officials said. NASA's Cassini spacecraft was launched in 1997 and arrived at Saturn in 2004. The spacecraft carried the European Space Agency's Huygens lander, which landed on Titan soon after Cassini arrived in orbit around the ringed planet. In 2008, Cassini completed its primary mission to explore Saturn, its rings and moons. Since then, the mission has been extended twice, most recently to 2017.